Photograph courtesy of John Liu at Wikimedia Commons. As a college student, I can attest to the fact that textbooks cost a lot. But, is their high cost out of the ordinary? 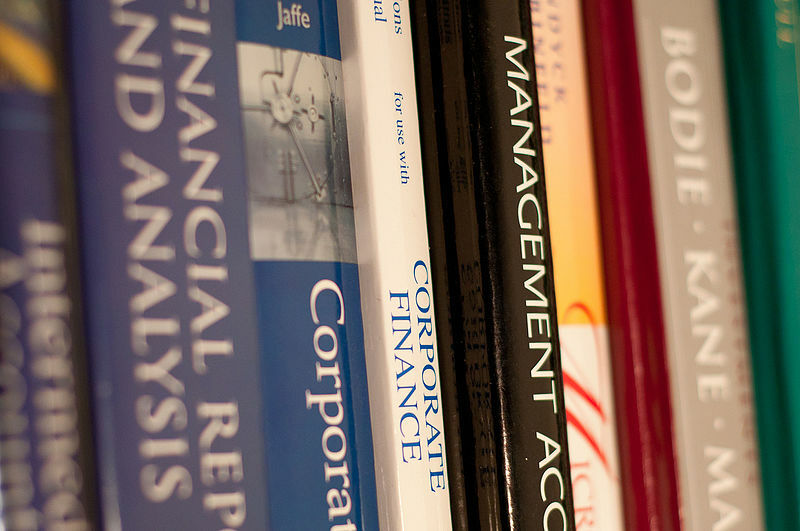 College textbooks have always been pricey, and with good reason. Writing and revising the books can require a large investment of time and expertise. Textbooks — especially those of upper-level courses — with a limited market are bound to cost more since royalties are relatively modest. Textbooks are valuable and it makes sense for them to have a hefty price. Unfortunately, what students are faced with is anything but ordinary. The real problem is how fast the cost of textbooks are rising in price. The College Board found that the average American student spends around $1,200 every year on textbooks and class supplies. A study done by the U.S. Government Accountability Office revealed that between 2002 and 2012, the price of college textbooks in the United States rose by 82 percent. An even more staggering statistic, reported by the Bureau of Labor Statistics, is that textbook prices rose by 1,041 percent between 1997 and 2015. Unfortunately, students don’t have much power in fixing the broken textbook market. According to the Scholarly Publishing and Academic Resources Coalition, students are captive consumers; this means the prices of textbooks can keep being raised because students have no choice but to purchase whatever books they are assigned. Essentially, students do not have much room in arguing for change. In my experience, the textbooks do help me prepare for tests. Depending on the professor, having a textbook can really help with understanding the material. Unfortunately, many students are having to forgo the added benefits of a textbook in order to save money. A 2017 Wakefield Study reports that 85 percent of students delay the course material. Of that 85 percent, over 90 percent cite the high cost as the reason for delaying. Also, 50 percent of students say that their grades were negatively impacted by their decision to delay purchasing the textbook. Amid these bleak statistics, we can come to the conclusion that textbooks are now hurting students more than they are helping. Students should not have to break the bank in order to strive for success, especially since most students are already drowning in debt. It doesn’t always have to be this way though. While students don’t have much power when it comes to fixing the textbook market directly, there are other ways to lessen the problem. There has been a push for legislation that would reduce the cost of textbooks; while congress did not advance with the bill when it was introduced, it is still a better alternative than doing absolutely nothing. Various states, such as Virginia, are passing legislation that mandates that public institutions create a framework to adopt and use educational resources across the state. The main motivation behind these bills is to encourage other academic leaders to adopt such methods and material in the future. Notably, Virginia’s community colleges have been working with open educational resources for a longer time than other institutions. Students at Central Virginia Community College can take over twenty classes without purchasing textbooks, and it is estimated that it has saved them $250,000 since 2016. While open educational resources might not be a viable option for every state, it is important that legislators understand that something has to change.